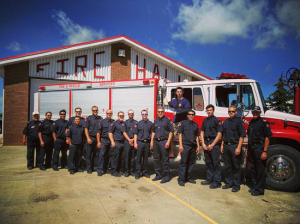 The Eston & District Fire Department proudly serves the Town of Eston, RM of Snipe Lake No. 259, RM of Lacadena No. 228 and the RM of Newcombe No. 260. The Fire Department is actively looking for dedicated new members. To become a firefighter applicants must pass a criminal records check, commit to training two times per month and have a strong desire to help the community. Junior firefighters can start as early as age 16 with parental permission. Full training as well as per diem pay is provided. For more information or to apply, please contact Fire Chief Richard Baran at 306-962-7456 or fire@eston.ca. Outdoor fires are permissible within Town of Eston limits. Should conditions become too dry, a fire ban will be put into effect by the Town. Outdoor fires must be contained within a non-combustible appliance constructed of material that is at least 16 gauge or 1/16 inch thick. Wood burning pits should be covered with a heavy metal screen. The width of a fire pit cannot exceed 36 inches. Fires must be supervised at all times, with consideration given for the effects of smoke drifting on neighbours. Noise should also be considered. Only clean wood, propane and charcoal are permitted forms of fuel. Burning of all other materials is illegal.